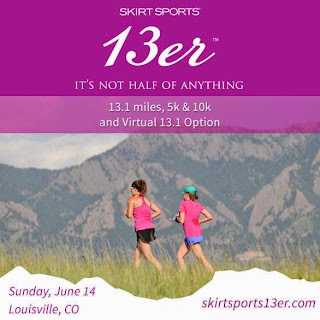 In honor of the #REALwomenmove movement, Skirt Sports is donating a free entry for the Skirt Sports 13er/10k/5K Local or Virtual race to one of my readers! Not only do you get registration to one of their races, but you also receive a Finisher's Skirt, all sorts of sponsor swag, and a $50 gift certificate to use either online or at their store and expo! $85 Basic Registration What you get: $50 Skirt Sports gift card, finisher skirt, sponsor swag, race number. Use your gift card to pick out a sweet top to go with your cute new skirt! $125 Upgrade 13er Registration. What you get: $125 Skirt Sports gift certificate, finisher skirt, sponsor swag, and race number. Why choose this options? Because you can get a complete Skirt Sports outfit plus additional race gear! $250 Skirt Lover's Paradise Registration. What you get: $275 Skirt Sports gift card, finisher skirt, sponsor swag, and race number. Want to stock up on skirts and gear for a great deal? Choose this option ladies! Heck, they are giving you $25 in gift card options just to register! I look forward to seeing you at the race, and to hearing your virtual stories. Share your race pictures with me on Facebook and Twitter! How will you be running the Skirt Sports 13er? Share your stories and race pictures here. I thought that I already commented, but I guess it didn't go through- or it did and I'll post twice. Anyway, it is so cool that you are a sponsored runner now. Way to go, hot mama! I think I would have to stick to 5k distance in with Boulder or virtual. Again, congrats on your marathon and all of your other accomplishments lately. You're so awesome! Thanks lady! And thanks for entering. You should do the race anyway, especially in Boulder ;) But I'm with you, I'm going to focus on the 10K for now. the half is my favorite distance for a race! The half is such a great distance! It's long enough to be a solid challenge, but short enough so you don't need to spend a week recovering. Post some pics of your run! Can't wait to hear about it. It is, especially since this one is done so well. The skirt and gift card make it even better. This sounds great! Never done a virtual race before! This is the one to do! It is well done, especially since you get both a cute skirt and gift card. You can register at www.skirtsports13er.com. I look forward to hearing about your virtual! Commented on Race Report: Big Sur International Marathon. I'd love to win this, I'm new to running and am looking for great gear! Thanks for entering! You should check out all the registration options for this event, they really have the best swag I've seen. Register at www.skirtsports13er.com. I already spent my gift card on new cute running outfits. Thanks for entering. This is really such a great race to do exactly that. I think it's wonderful that you run with your wife; I'll bet she enjoys it. You can check out all their registration options at www.skirtsports13er.com. Thanks for entering. You should check out all the registration options at www.skirtsports13er.com. It's such a fun race. Excited for this giveaway, would love to spend my birthday on June 14 celebrating with new outfit and CAKE!!!! Thanks for entering. Wow, what a great way to celebrate your birthday. Running and new clothes and cake...I can't think of a better way to say happy birthday. Check out all the registration options at www.skirtsport13er.com. Congratulations to my contest winner Mary V! And thanks to everyone who entered. 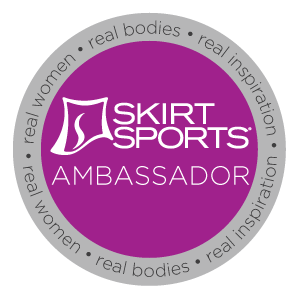 I'd love to see you all there, so check out the Skirt Sports Registration options at www.skirtsports13er.com. Let me know if you're running in Colorado or virtually, and keep stopping by for more contests in the future.